In 1720 an Arian (Unitarian) Meeting House was built in Mint Lane but, by the beginning of the 19th century, this had closed and the remaining congregation had joined George’s Meeting in South Street. A meeting house or place of public worship was needed by Protestant Dissenters and the land vacated by the Arians was purchased in 1812, with an ancient way of passage through to Mary Arches Lane. 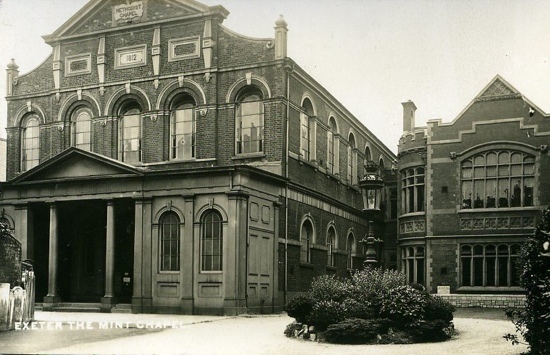 Money was raised and on 25 March 1813 the Mint Meeting House was opened. They built their Chapel on a grand scale, which meant the Church started life with a debt about ten times more than the amount they had raised during the year of building. The design reflected the taste of traditional ‘Church Methodists’ who cherished the link with the Church of England. The Chapel was entered through a portico into a vestibule with steps to galleries on three sides. There was a tall central pulpit with a clerk’s table and a communion table in an apse behind. (The apse can still be found behind curtains together with the initial inscriptions). At first, services were accompanied by music played by fiddles, flutes and some singers, in keeping with some non-conformist churches nowadays. However, an organ was installed in 1834, paid for by donations. By 1859 the original debt had been repaid which allowed the chapel to be rebuilt and enlarged in 1867. During that time, a School for boys was opened in 1846 for 350 children to be taught the Wesleyan Doctrine to be followed by a second School for girls in 1853. Both closed in 1938. The Church has had a number of benefactors over the years; two notable ones were Thomas Rowe and Thomas Andrew. Thomas Rowe was a member of the Rowe family who became well known builders merchants. Later, in 1920, Rowe Brothers took over the site of the Victoria Hall which had burnt down in 1919, and built a store, now taken over by Exeter College. Thomas Andrew however, in addition to his business interests, became High Bailiff and subsequently in 1881 the first Methodist Mayor of Exeter. In 1878, the two of them bought five old houses which stood between Mint Lane and the Church, one of which was occupied by the sexton. In the same year Thomas Rowe bought the freehold of the Oat Sheaf Inn and stables which was in Fore Street, where the front entrance is now. In Thomas Rowe’s will the freehold of the Oat Sheaf Inn and stables and brewhouse was given to the Church and they obtained permission to demolish the premises. In 1894 the large entrance to Fore Street was created on the site with the remaining gravestones being placed against the boundary wall. The Chapel that was rebuilt and enlarged in 1867 continued in use until a structural survey in 1965 declared the roof unsafe. When the Chapel was demolished it was found that not only had the roof truss curved and the wall cracked causing the church to start slipping into the burial vault, but the whole building had no or insufficient foundations particularly under the 1867 enlargement. While the Chapel was being rebuilt as a modern city church the congregation worshipped in St. Mary Major in Cathedral Yard. One of the features of the new building was a tower, which helped to blend the new with the wing of the original building that has remained throughout the changes of the late 20th and early 21st centuries. The new building was in a chevron style and a variety of materials were used including glass from the Cotswold, afrormosia wood for the pulpit and ivory muhuhu in the herring-bone floor panels. 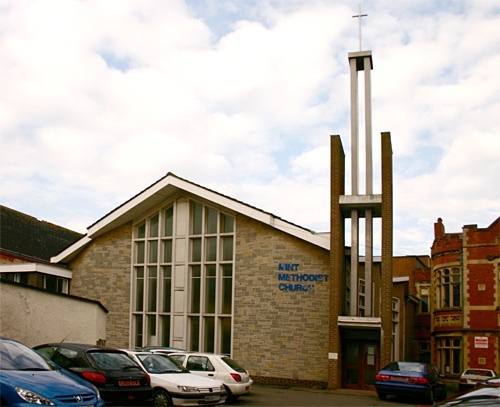 This took five years and the new church was opened on 31 October 1970, free of debt. 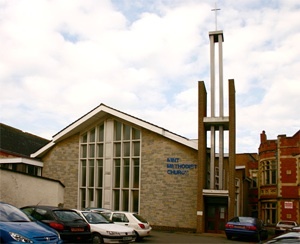 In 2010 another major redevelopment brought the Church into the 21st century. The tower was lost but it now operates with state of the art facilities for its current role as a busy community resource open all week. The church is very proud of its connection with John Wesley. John and Charles Wesley first came to Exeter in September 1739 when John preached at St. Marys. In the church there is a portrait of John Wesley and an oak drop leaf table on which he stood, while preaching in Southernhay, stands in the foyer. Sources: History of the Mint by Brian LeMessiur, and various pages on the internet. The Mint Church in the early 20th Century. The tower was demolished in 2010. 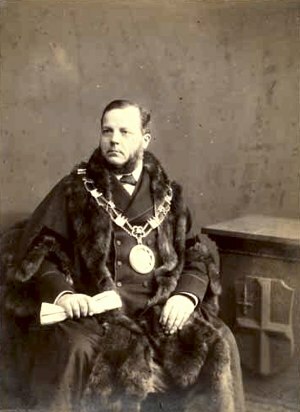 Thomas Andrew, Mayor in 1881.